In 1970, Cyclone Bhola slammed into East Pakistan – present day Bangladesh – with sustained winds of 150 miles per hour, killing as many as half a million people. In 2007, Cyclone Sidr killed 3,406 people in Bangladesh. This year, Cyclone Roanu killed just 30. What’s behind this huge decline in mortality? What has Bangladesh done differently? The International Center for Climate Change and Development (ICCCAD) along with the United Nations University Institute for Environment and Human Security, based in Dhaka, has been researching and attempting to build community resilience to cyclones and the impacts of climate change since 2007. I was fortunate enough to join ICCCAD staff on a visit to the village of Dalbanga South in the Barguna district of southern Bangladesh three weeks after Cyclone Roanu struck in May. Villagers here are predominantly fishermen; some are pastoral rice farmers. The objective was to assess what was done during the cyclone and the effects of initiatives to preserve local livelihoods and lives. 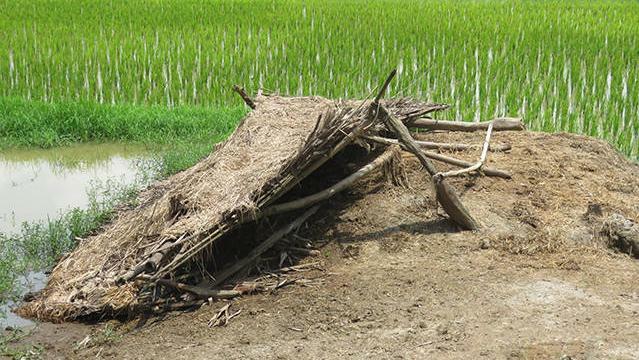 Since Bhola and Sidr, improvements to Bangladesh’s early warning and shelter system have helped save countless lives. Weather stations relay information to early warning volunteers through cell phones. Those volunteers then use public address systems, typically used for prayer calls, to sound the alarm and notify villagers to go to a cyclone shelter. Depending on the information relayed, a certain number of flags are raised above the shelter indicating the strength of the storm. South Barguna’s cyclone shelter, apart of a system of shelters that has helped save countless lives. Photo by Mickael De Souza. Villagers sometimes bring food, medical supplies, and even livestock – key to their livelihoods – into the shelter. Once a cyclone hits, villagers may remain inside for a few days until the water level, winds, and rains subside and conditions are safe again. Some leave early to save cattle and goats, putting them at the mercy of the elements, and these account for many of the remaining casualties. The remains of a home in Dalbanga South three weeks after Cyclone Roanu. Photo by Mickael De Souza. Fortunately, no one in Dalbanga South was killed during Cyclone Roanu. The main difference between cyclones nine years ago and today is that communities know much more. Villagers with access to television and radio can hear about the storm earlier than through the volunteer system, and the amount of villagers who have access to radio and television has steadily risen. For many, the early warning system functions as a safeguard to check and see if the information matches what they’ve heard elsewhere. The village also recently built an irrigation system with the help of outside NGOs that allows stagnant water to flow back into the bay and bring water levels down more quickly. NGOs have played a prominent role in funding research and mitigation efforts. 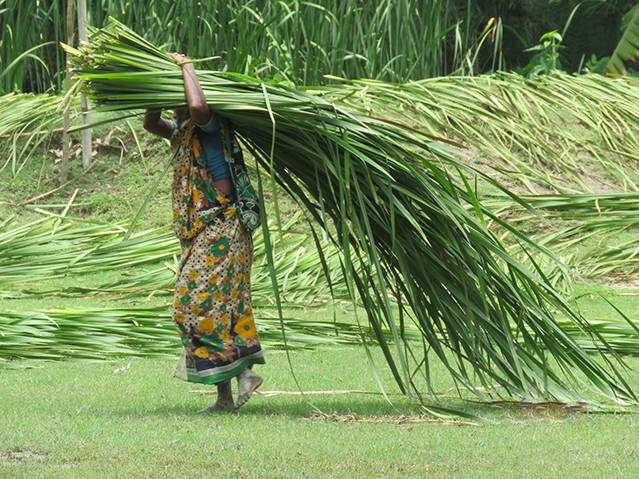 The cyclone shelter in Dalbanga South was built thanks to contributions from USAID and the Bangladesh government, but also local groups like the Bangladesh National Woman Lawyers’ Association and international organizations like Plan International. ICCCAD is particularly focusing on long-term riverbank erosion at this site, caused by an increase in the amount and variability of seasonal flooding. 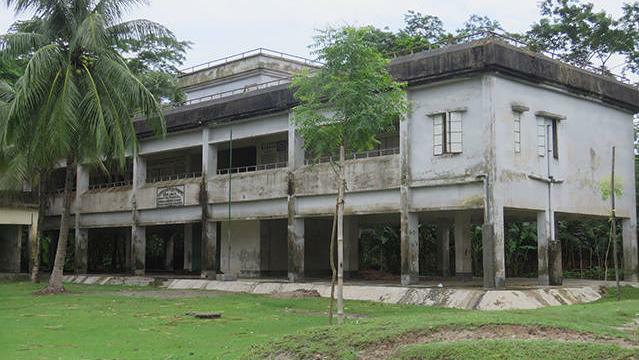 Researcher Istiakh Ahmed noted than when he visited in May 2014 a house stood where now only the Bishkhali River flows. Villagers asked for help building a levy to lessen some of the effects of this flooding, including erosion, increased salinity which affects farming, and changing fishing patterns. 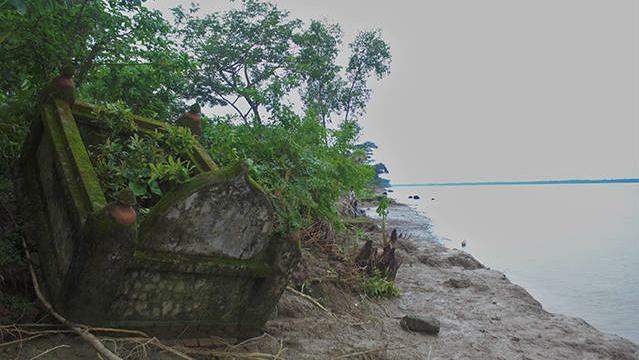 A tomb in Dalbanga South that has fallen off the mainland as the riverbank erodes. Photo by Mickael De Souza. But many NGOs including ICCCAD lack the funding to build such infrastructure, and in many cases can only collect data in the aftermath of an extreme weather event. Villagers asked the researchers to come more frequently, every three months or so, to help them learn how to handle the impacts of climate change, and not just cyclones. Yet this may prove difficult because Dalbanga South is one of many communities being surveyed and studied through ICCCAD’s Gibika Project. The effort is an attempt to shield and adapt traditional ways of life from environmental changes at seven different sites. 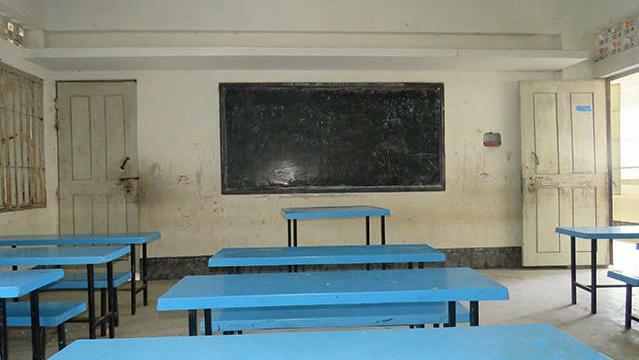 Many cyclone shelters in Bangladesh double as schools. Photo by Mickael De Souza. There is more work to be done to adjust to climate changes in these fragile coastal areas. Sea-level rise of half a meter by 2050 could result in Bangladesh losing about 11 percent of its land area and affect 15 million people. But the system was nonetheless impressive. Three weeks after Cyclone Roanu, villagers were putting the final touches on repairing the last of the broken houses, wrecked boats, and leaking roofs. The shelter had returned to duty as a schoolhouse. Kids were swimming, men were fishing or farming, and women were tending to the young.